This has been one of the most difficult posts I’ve ever tried to write. And I’m not exactly sure why. Originally I just wanted to touch on the fact that I turn 31 years old tomorrow and that my birthday falls during National Infertility Awareness Week. So why won’t the words come? I suppose it’s partially because I thought I would be a mother before I turned 30, much less 31. And every birthday that passes reminds me of the birthday that is yet to come– that of my eventual child. I suspect that everyone gets a little introspective around their birthdays. You think about what you accomplished in the previous year. What you hope to accomplish in the new one. Though my hopes are varied and include many different things, becoming a mother is still at the top of the list. Having a birthday that falls during National Infertility Awareness Week is a bit of a double whammy. Not only am I another year older and somehow no closer to donning maternity wear, but I am also reminded of the 7.3 million other people in this country affected by infertility. That’s about 1 in every 8 couples. In some ways, it’s comforting to know there are so many other women out there just like me. And in other ways, you feel the enormity of the situation and want to just sit down and cry. I spent the holidays and most of the winter months getting my head together for my next round of fertility meds and all that goes along with taking them. There was guilt I had to let go of. Control issues to conquer. Anger. Sadness. Self-pity. The culmination of all that soul searching can be found here. But during one of those long, gray winter afternoons, I turned on the radio during my commute home only to hear a strangely sad and yet inspiring song. Carry On by Fun is “a song about perseverance in hard times.” No wonder it appealed to me so much. I was practically in tears listening to it as I drove along the outer loop. It reminds me of those currently popular images on Facebook that are variations on the British propaganda poster, Keep Calm and Carry On, and not just because they use the same words. Now tell me truly, do I look 31 years old to you? 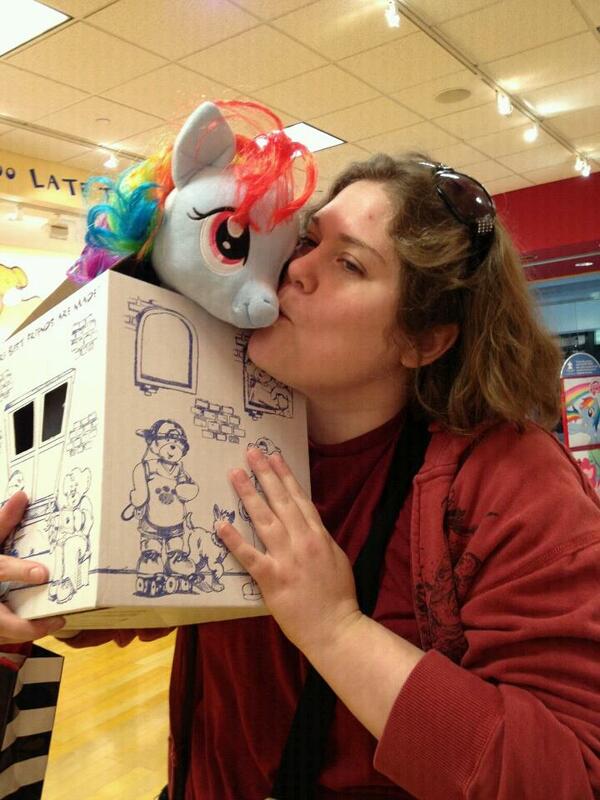 My birthday present from Amy: a Rainbow Dash My Little Pony from the Build-A-Bear Workshop. SWEET!